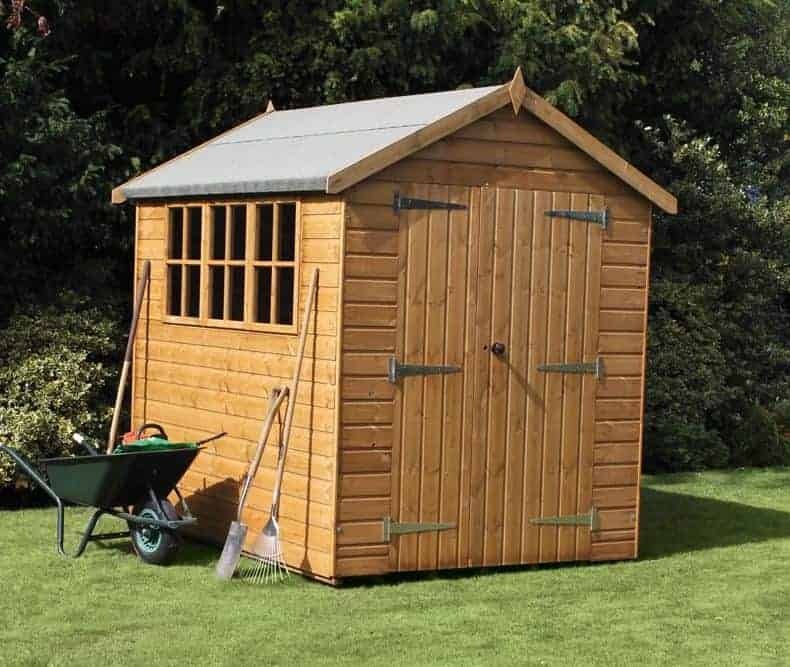 This attractive looking shed is tough and durable enough to cope with all that the British climate can bring, thanks to its apex roof and tough tongue and groove cladding. Whilst the pitch of the roof simply carries water or snow away, the tight fitting shiplap cladding means that there are no gaps through which water can enter. This means that the building as a whole should have good rot resistance, although we would have liked to see the warranty period reflect this. 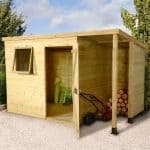 With the generous depth that this shed provides, and an accommodating height as well, it’s a garden building you’ll enjoy spending time in. With six windows there’s always lots of natural light inside, and as door of the windows are opening rather than fixed, it’s easy to create ventilation and regulate the temperature as well. The profusion of windows potentially makes it easy for passers by to see what’s kept inside, but as they only feature on one side of the shed, smart positioning will allow the owner to create a more secure environment. With security in mind it was also good to see a high quality key operated blocking system supplied as standard, rather than being an optional extra. 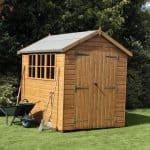 Our first impressions were that this is a very attractive timber apex shed that will complement any garden. Whilst adhering to a traditional rustic style, the smooth planed cladding gives it a look of real quality, and the six windows featured on one side panel also give it a unique and contemporary touch, as well as being very practical. The apex roof at the summit is very effective at keeping water out and the contents inside dry, and that’s because it’s made of tongue and groove cladding and covered in strong roofing felt. It creates a ridge height of 2.34m and an eaves height of 1.85m, meaning there are no difficulties in storing tall items. 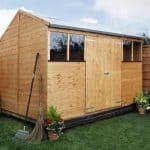 Keep in mind that the shed is twice as deep as it is wide, with outer dimensions measuring 3.66m and 1.83m respectively, when choosing the best spot in which to position the shed. The basic thickness of the tongue and groove cladding is 12mm, which is a measurement we often find on the timber sheds we review. On this occasion, however, we were pleased to see that PAR cladding had been used. This smooth cladding is very tough and equates to a thickness of 16mm in standard cladding. Extra stability and rigidity is also provided by the frame, which at 44 x 44mm is considerably sturdier than most wooden framing we see. This will come in particularly useful in areas that are often exposed to high winds. Whilst the floor itself was also tough and resilient, thanks to it utilising the same tongue and groove cladding, we have concerns about it being in contact with the ground which is where high moisture contents are often found. For this reason we strongly recommend the purchase of the optional floor bearers, and indeed would have expected to see them included with a shed in this price bracket. Another area in which the shed performed less well than we would have expected is in its warranty. 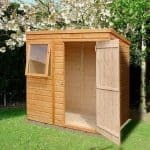 All wooden sheds come with at least a one year warranty, and in this case there is no extension, whereas we commonly see cheaper garden buildings that carry warranties of ten or fifteen years. One reason why the warranty may be so short, despite the high quality rain protection offered by the cladding, is that the timbers have been dip treated but not pressure treated. 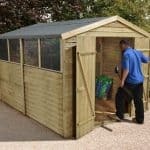 This means that there’s a requirement for the customer to treat the shed with wood preserver themselves on an annual basis, as well as within six weeks of it being installed. We liked the single hinged door, as it’s both wide and tall enough to move objects in and out without having to bend or twist. In fact, the width of 0.76m is as wide as some double doors we see, and the height of 1.83m is much taller than most doors on wooden sheds. A wider door measuring 4’ can also be purchased as an optional extra. The windows were the feature we liked most of all. Not only because there are six of them, ensuring that the interior is well illuminated in daytime, but also because two out of the six are opening while the other four are fixed. This makes ventilation control as easy as opening and shutting a window. With thick horticultural glass being used as the glazing, the windows will resist all but a concerted attempt to break them. Further security is provided by the inclusion of a key operated locking system on the door, which we were pleased to see as it’s not something that all manufacturers include as standard. Some people find installing a shed an enjoyable, even relaxing, experience while others find it time consuming and frustrating. 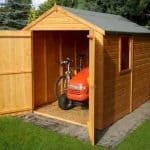 The latter group will be pleased to hear that a professional assembly service is available for £144.99, which we think is a very useful service that will broaden the shed’s appeal. Not all customisation options cost money, however. We welcomed the option to have a fully boarded, and therefore window free shed at no extra cost, as this makes it ideal for use as a security shed. This shed both looks and feels high quality, and the use of superior tongue and groove cladding throughout is just one indication of this. The basic one year warranty against rot doesn’t mean that the shed won’t perform much better than that, but it fails to provide reassurance. The relatively small width is more than compensated for by a long depth and a good height as well. The number of windows means that you may have to spend a little longer on installation, unless you use the optional assembly service of course, so with a friend’s help you should allow at least six hours for the process. At approximately a thousand pounds, we would have liked to see a shed that is pressure treated and with an extended warranty, even though it is well constructed. Final Thoughts: We have to be demanding with timber sheds that cost around the thousand pound mark, and this shed lacks some features that we routinely find on less expensive sheds, such as a tanalised treatment or the inclusion of floor joists. In other areas, however, it does score well, such as the peace of mind and security provided by the key operated locking system which can itself be further enhanced if required by opting to have a fully boarded shed without windows. It was also good to see PAR tongue and groove cladding used on the walls, floor and roof, giving extra strength and providing a reliable defence against rain.